Before centralized air conditioning was a staple of residential homes, swamp (or evaporative) coolers were extremely common. These evaporative coolers essentially cooled the same way as individuals did pre-air conditioning: with cool towels and fans. Swamp coolers mimic this cooling process, just on a larger scale. While swamp coolers can be effective and affordable, there’s a reason why modern homes have air conditioning units installed and why swamp coolers have become obsolete. 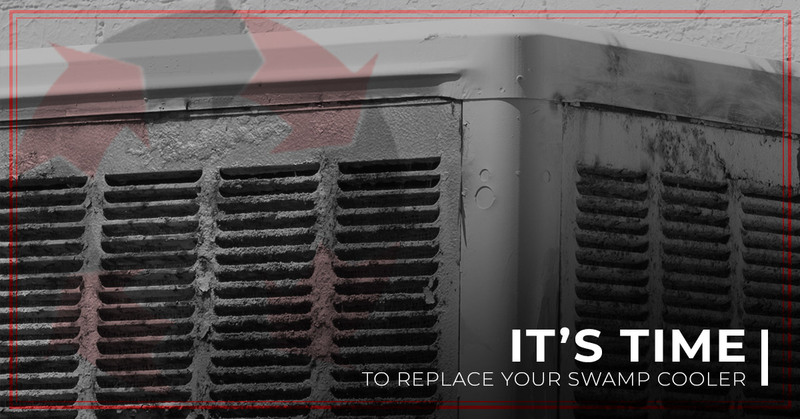 If you have an older home that relies on a swamp cooler, consider now the best time to replace your swamp cooler with a new air conditioning unit. Evaporative cooling generally works best in arid climates — and Belleville, MI, as you know, is just about the furthest thing from “arid” there is. The mechanics of evaporative cooling explain why it’s generally less effective in humid climates. Swamp coolers take hot air from the atmosphere and use water pads to cool the hot air. Then, the colder air flows through the home and leaves via windows and vents. When air goes through this process, it becomes more humid (thanks to the water). The last thing you want in a humid climate is for air to carry more moisture. It’s a disaster for airborne allergens, moisture issues, and air quality. There’s no such thing as a thermostat for swamp coolers. While the air might be cooler, it’s much harder to regulate. With an air conditioning unit, however, the biggest difference is indeed the “conditioning” aspect. Air conditioners work thanks to refrigerant (rather than water pads). Refrigerant is responsible not only for cooling the air, but also for reducing humidity. When air comes out of an air conditioning unit, it’s cleaner, cooler, and more controlled. It’s true that air conditioning installation is more expensive than evaporative cooling installation. But where the start-up fees are higher, the HVAC service and maintenance fees are greatly reduced with AC. Additionally, having an air conditioning unit adds value to your home, so it more than makes up for the initial installation cost when it’s time to sell your home. If you rely on evaporative cooling, you have to perform maintenance on your swamp cooler each winter and summer. Swamp coolers are also known to leave water stains on shingles, greatly increasing your chance of moisture issues. Plus, any time you want to service your swamp cooler, you have to climb to the roof to do it. In a Belleville winter, this can be dangerous in addition to inconvenient. Alternatively, air conditioning units usually require little maintenance. All you need to do is change your filters on a routine basis and clean the coils from time to time. If you want to replace your swamp cooler in Belleville, Air Temperature Control, Inc. is the leading HVAC service around. Call us today to schedule HVAC service or AC installation.